Last month, Chris Buskirk wrote a column for the Spectator USA describing Representative Devin Nunes as “a hero of the Republic.” It was well-deserved praise. Nunes, a Republican Congressman from a rural district in California was, until January, chairman of the House Permanent Special Committee on Intelligence (he is now the ranking member). Nunes has worked tirelessly for more than two years to expose what our masters in deep-state Washington would bury from the glare of public scrutiny: the evidence that the entire Trump-Russian collusion narrative was a partisan effort, first, to undermine the Trump presidential campaign and, when that failed, to cover up the effort while still working assiduously to destroy the Trump presidency. As Buskirk points out, without Nunes’s terrier-like efforts—conducted, it has to be pointed out, against the background of scurrilous and unremitting calumnies from the Democrats and their bought-and-paid-for megaphones in the media—the public would likely be totally in the dark about what really happened over the course of 2016 as the Obama Administration and the Hillary Clinton presidential campaign endeavored to “dirty up” Trump and his colleagues, calmly at first, and then with growing hysteria as Trump, against all the odds, emerged as a serious challenger and eventual victor in the election that all the smartest people knew, just knew, that Hillary had sewn up. Think about it: without Nunes we wouldn’t know that “Susan Rice, Obama’s National Security Adviser, spied on members of the Trump campaign before the election and then unmasked their names with the likely knowledge that they would be leaked—which they were.” Pause for a moment to think about that. The national security advisor for one administration spied on members of her political opponents in a presidential election and then unmasked their identities and made sure their names were leaked to the press. If you don’t find that breathtaking you have become too inured to living in a banana republic. Savor that tidbit as well: a dossier of unverifiable gossip secretly commissioned and paid for by one campaign covertly injected into the intelligence apparatus of the United States to justify a counterintelligence investigation against an opposing campaign. And note the role of the late “maverick” John McCain, surely one of the most disgusting political actors in recent American history: it was at his request that Christopher Steele wrote the final installment of his vampire fantasy, a.k.a., “the dossier,” and it was through McCain’s intervention that the dossier was given to the FBI and emunctory media outlets like BuzzFeed. You can see why the Democrats don’t like Devin Nunes. He has been instrumental in exposing the plot to destroy Trump the candidate and then, when that failed, to undermine the Trump presidency. As I have been saying for a couple of years now, this is the biggest scandal in American history. It dwarfs Watergate. Indeed, it challenges the fundamental integrity of our democratic—i.e., accountable—institutions. It challenges, too, the sacrosanct ideal of the separation of powers. Finally, it challenges the presumption of basic fairness and open competition without which our republic could endure in name only. Anyone who cares about future of our political system, be he Democrat or Republican, owes Devin Nunes thanks for his efforts. And that debt has just been compounded with Nunes’s announcement that, “now that we have an attorney general,” i.e., William Barr, not Jeff Sessions, he is sending eight criminal referrals to the Department of Justice. As Nunes explained in an interview with Maria Bartiromo, five of those referrals are “straight-up” referrals about a specific crime: lying under oath, for example, or leaking classified information. The other three referrals are more complex. One involves conspiracy to lie to the FISA court. A second involves the manipulation of intelligence for partisan political ends. The third involves what Nunes calls “global leaks” of highly sensitive information: a call between the Australian Prime Minister and President Trump, for example, a call between the Mexican president and President Trump, and a call between General Mike Flynn and Russian ambassador Sergey Kislyak. How many people had access to such information? How many were in a position to leak it? We do not yet know the names of those being referred to the Department of Justice for review. All told, Nunes estimated that the total number might reach “two-dozen” individuals. What the outcome of the referrals will be is anyone’s guess. Disgraced former Deputy Director of the FBI Andrew McCabe has been referred to the U.S. Attorney in Washington, D.C. but as I write he is traipsing about the country on his book tour telling people about how he, Deputy Attorney General Rod Rosenstein, and others thought about trying to get Trump’s Cabinet to go along with a plan to invoke the 25th Amendment to remove him from office. Which is to say, a criminal referral, while not something you would choose for a holiday weekend, is not necessarily the end of the line. But will they? The jury is out on that. In a recent column for the Washington Examiner, Devin Nunes wrote that “It is astonishing that intelligence leaders did not immediately recognize they were being manipulated in an information operation or understand the danger that the dossier could contain deliberate disinformation from Steele’s Russian sources.” It is in fact so astonishing, he goes on to note, that it is positively incredible, not in the sense of amazing but in the root sense of not credible. Turning the full force of our intelligence agencies first against a political candidate and then against a sitting president. Let that sink in for a moment. As Nunes notes, the whole Trump-Russia hoax was “a gift to our nation’s adversaries, most notably Russia.” Beyond that, though, the partisan weaponization of our intelligence and police services is a serious blow to the integrity of our democratic institutions. The entire Trump-Russia investigation—the Mueller hoovering operation, of course, but also “Crossfire Hurricane,” the counterintelligence probe that began at the end of July 2016, as well as the preliminary forays into the Trump campaign by shadowy figures like Stefan Halper and other “assets” of British and American intelligence services—the whole kaleidoscopic spectacle has proceeded on two tracks. One track is legal. There were tips, suspicions, insinuations, worries. They provided the pretext for the various investigations and surveillance. Here we ask questions like, were the CIA and the FBI justified in the courses of action they took? Was it OK to take out a FISA warrant on Carter Page, an American citizen, who has never been charged with a crime? What besides the Steele Dossier, “oppo research” that has been shown to be a tissue of lies and innuendo, justified that extraordinary step? Was it OK to spy on the Trump campaign? Did the CIA and FBI follow their own protocols? Did key individuals break the law in pursuing President Trump and his associates? The other track is political. Whatever nuggets of suspicious activity British or Estonian intelligence communicated to John Brennan, what are we to make of the machinery he helped set in motion? In my view, the Trump-Russia hoax (to use Nunes’s term) was primarily a political operation. The legal aspects were merely pretexts for the main event, which had two phases: preventing Donald Trump from becoming president, first of all, and then destroying his presidency. 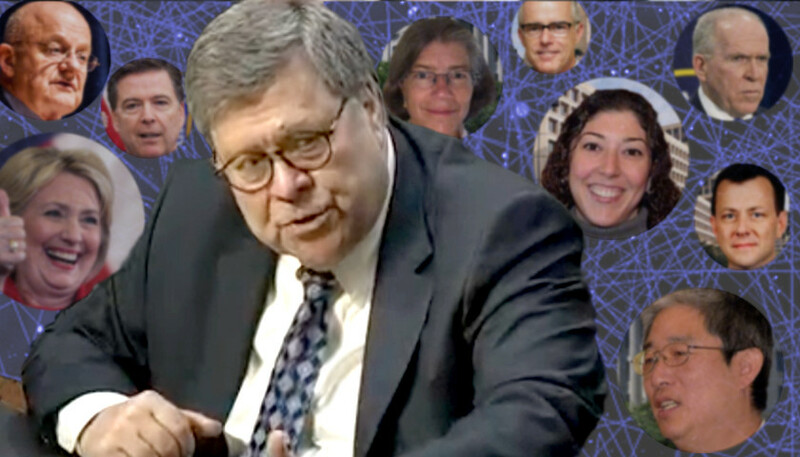 A long and tedious process has been set into motion by Devin Nunes and others, and Attorney General William Barr appears determined to see it out. But the scary bottom line is this: over the last couple of years, one political party, aided and abetted by a compliant media and a deep-state bureaucracy, conspired to void the results of a free, open, and democratic election because they disapproved of the people’s choice. Some people think that it would be best if we put this whole episode behind us, that we sharply limit any investigations into wrongdoing and that, especially, we refrain from punishing the highly placed actors who leaked, lied, and conspired against the president. I am not of their number. What just happened in the United States represented an existential threat to the integrity of our institutions. It happened because highly placed individuals had cultivated a sense of entitlement and presumption of higher virtue—what James Comey called a “higher loyalty”—which they believed exempted them from the constraints and procedures that the rest of us must observe. They broke the law because they believed that they answered to a “higher” law. Out of such convictions are revolutions born and countries destroyed. The best safeguard against it happening again—indeed, against it continuing on now—is to hold those responsible to account. It is too early to say whether that will happen. As I say, some of my friends think it would be a bad thing for the country to pursue high-profile indictments. I, on the contrary, thinking about what the country has just been put through, believe that our best hope of preventing this from happening again is to make an example of those who, smitten with the delicious sensation of their own virtue, did their best to reverse the results of an election because a candidate they did not like had the temerity to win. Roger Kimball is Editor and Publisher of The New Criterion and President and Publisher of Encounter Books. Mr. Kimball lectures widely and has appeared on national radio and television programs as well as the BBC. He is represented by Writers’ Representatives, who can provide details about booking him. Mr. Kimball’s latest book is The Fortunes of Permanence: Culture and Anarchy in an Age of Amnesia (St. Augustine’s Press, 2012).